Browse: Home / “Saving the Handover Mascot” Campaign / Petition to designate large Marine Park and reroute ferry traffic to save pink dolphins! Petition to designate large Marine Park and reroute ferry traffic to save pink dolphins! ‘Saving the Handover Mascot’ – Last resort to save pink dolphins in Hong Kong! This year, Hong Kong is celebrating the 20th anniversary of the handover from Britain to China; however, Chinese White Dolphin has a rough life over these 20 years as a mascot. During these years, their home, waters near Lantau Island, is being exploited, and their vulnerable children could hardly escape from this piece of land. Dolphins suffocate from tones of construction and reclamation works surrounding Lantau, unfortunately, the works are not going to stop yet. In 2014, the 2nd largest reclamation work, the third runway, applied for the environmental permit which is issued by the Environmental Protection Department (EPD). As we, Hong Kong Dolphin Conservation Society (HKDCS), deeply know the reclamation work would follow by catastrophic consequences to the dolphins, we have launched a campaign in June called “30 Third Runway Victims” attempting to save the dolphins. Almost 20,000 of citizens responded to our petition within 30 days trying to stop the permission from EPD and the expansion of Hong Kong International Airport into a Three-Runway System. Unfortunately, EPD refused to hear from the people but continue to issue the environmental permit to Hong Kong International Airport. Today, in 2017, the reclamation work of the third runway begins. 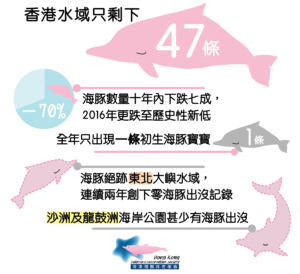 Over these years, the government would sometimes claim that they are going to set up marine parks to conserve dolphin’s habitat and protect them, yet, the total number of dolphins in Lantau area keeps decreasing. The number dropped by about 70% in 10 years’ time, and in 2016, only 47 dolphins were left which was the lowest record ever. After all these years of observation, we could summarize 5 problems of the marine parks which leads to the failure of the marine parks to protect the dolphins. If the marine park is a noisy environment, full of fatal threats and even could not provide sufficient food for dolphins, it could be a failed marine park. And for dolphins, they could hardly notice the boundaries of a marine park which is set up by human, they could only differentiate the place is favourable or not by the actual quality of their living. At the moment, the dolphins are in a very critical situation. To save them, we, as a human being, should step forward to ease their danger and solve those problems to ensure the quality of their habitat. Therefore, we would like to continue the “30 Third Runway Victims” action and rename as “Saving the Handover Mascot”. The reclamation work of the third runway could not be the termination of Chinese White Dolphin’s conservation work. The “Saving the Handover Mascot” action not only criticizes the current problems happened in the proposed or designated marine park and provides fundamental solutions but also encourages involvements of citizens to sign the petition, guard our dolphins and speak up for them. We are the only one who shall re-connect their homeland and alter their tragic. Most people thought that dolphins could live and travel everywhere, but the habitat of Chinese White Dolphin(CWD) is indeed inshore and limited to the water depth of 30m. They tend to stay in brackish water of estuaries which is nutritious and has rich fisheries resources. In Hong Kong, they have certain distribution as well instead of randomly distributed, since CWDs are smart animals and would make their preference on its habitat. It is as complicated as a “biogeography”. Therefore, different waters serve different purposes to dolphins, and all these waters come into a same characteristic – high density of dolphin, which is perceived as dolphins’ important habitat. The way that dolphins make use of the habitat is indeed the same as us dividing our home into kitchen, bedroom, living room and toilet, and therefore, each part of their “home” is necessary. Other than that, if long-term sightings of individual dolphin are successful, researcher could even construct specific core range of activity for each dolphin. After years of analysis, the result implies that each dolphin has their own preference on their “home”, just like each of us have our favorite spot. In 2014, the “third runway victim” activity was exactly using this method to find out thirty victims where their core range of activity is superimposed with the reclamation work of constructing third runway. In recent years, the core activity range of Hong Kong Chinese White Dolphins is severely affected by the rumble of high speed ferry and reclamation work of the Hong Kong-Zhuhai-Macau Bridge, including the artificial island, main bridge and link road between Tuen Mun and Chek Lap Kok. Dolphins who were used to be living in Northeast Lantau must have to abandon their home, and dolphins who seldom left North Lantau waters are forced to move afield to South Lantau to avoid the construction works. Please bear in mind that all these serious consequences affecting dolphins are caused by human that they are the ones suffering instead of us. Their home is lost and now they have no choice but to fight for another home with their companion. What is Marine Park / Dolphin Protective Area? According to Marine Parks and Marine Reserves Regulation (Cap. 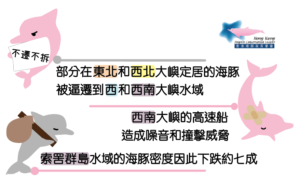 476A), development works are prohibited, power-driven vessel shall not exceed 10 knots, only small fishing boat with a permit granted by the authority shall fish in marine park, anchoring is prohibited and other more laws are listed out to protect Chinese White Dolphins’ habitat. They not only help prevent offshore works, but more importantly sustain high-quality marine parks, and elevate their ecological value, so Chinese White Dolphins could forage, reproduce, travel and socialize safely. Back to the days when the Hong Kong-Zhuhai-Macau Bridge had not started constructing, Sha Chau and Lung Kwu Chau Marine Park, which is the first marine park served for Chinese White Dolphins, was once an effective measure and a feeding ground for them. 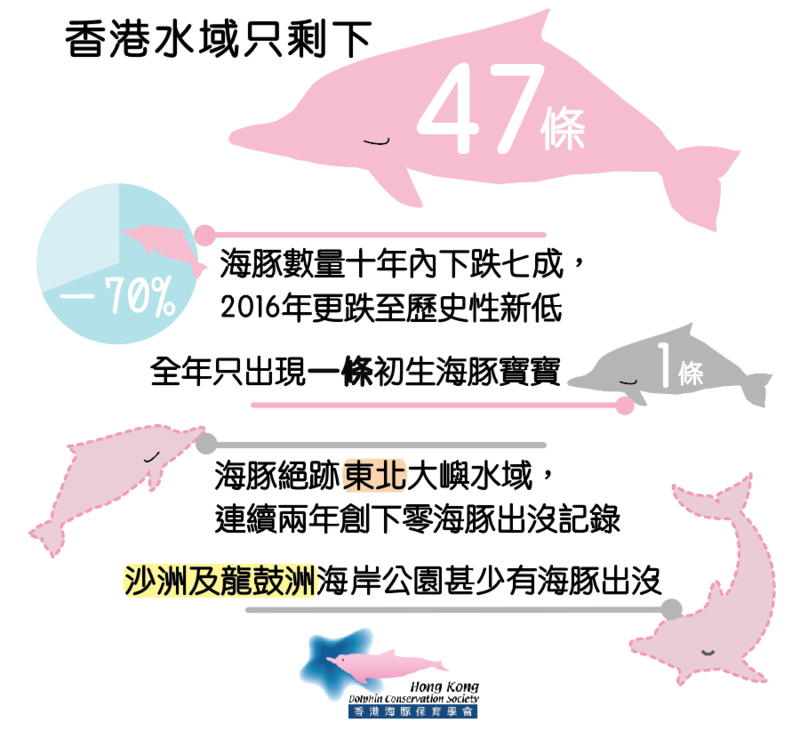 Ecological value of Marine Parks situated at North Lantau has been greatly reduced because of the surrounding reclamation work, which leads to the declining trend of dolphin usage. The current damaged area is much greater than the designated protected area and the habitat of dolphins is suffering from irreversible impact, the pace of conservation is much lack behind of wrecking. A big patch of area is bringing more benefits than pieces of fragmented habitat. However, the high-speed ferry channel is exactly located in the waters between Southwest Lantau and Soko Islands which serves as critical traveling corridor of Chinese White Dolphins. The channel is just like a cookie cutter cutting the habitat into small pieces and affecting the movement of dolphins. For dolphins, the threat of high-speed ferries should be the first topic to be concerned, unfortunately, both proposed marine parks (Southeast Lantau and Soko Islands Marine Park) seems to avoid the overlap with the high-speed ferry channel, and therefore could only bring slight benefit to the dolphins. But, the problem of high-speed ferries remains unsolved. All conservation measures of the construction work of the huge infrastructure, Hong Kong-Zhuhai-Macau Bridge and the Third Runway, come after of the construction. That means, the habitat is not under protection and dolphins are losing home during the time of construction. Would marine parks still be effective afterwards? ‘Set up marine parks for dolphins’ core activity range AFTER RECLAMATION!’ Environmental Protection Department said. After 5 years, when the marine park is set, dolphins are gone. The Brothers waters in Northeast Lantau was once a core activity range of dolphins til 2012, acting as an important place for foraging and parenting. It was designated as the Brothers Marine Park in 2016 to compensate harm brought to dolphins by the construction of HZM Bridge. However, after being devastated by 4-year reclamation work, the ecological values of this piece of waters is hardly comparable to the past. A ‘zero dolphin’ record was even hit in 2015. This is all attributed to the government’s approach of ‘conservation after development’. ‘Due to the Third Runway construction, moving north Lantau fairway of high-speed ferries to the north of marine parks will not do any harm to dolphins.’ Said Airport Authority Hong Kong. Since then, dolphin number in marine parks dropped. Sha Chau and Lung Kwu Chau Marine Park, with about 1,200 ha area, was built early in 1996 and became an important habitat for dolphins in Northwest Lantau. 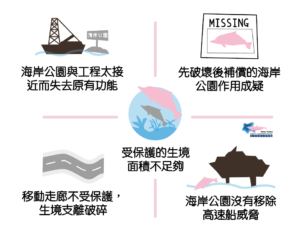 However, construction of HZM Bridge not only drove away dolphins from the Brothers waters, but also affected dolphins in the entire north Lantau water, including those in Sha Chau and Lung Kwu Chau Marine Park. According to data in 2015, the function of marine parks was largely diminished and the hotspots of dolphins reduced from the whole marine park to only the north waters. In 2016, due to the Third Runway reclamation work, the high-speed ferry fairway in the north of airport was narrowed and therefore had to move to the north. The north waters of the marine park, without many interferences in the past, are now frequently packed with busy ferries which ran about 40 times per day. Even though the speed of ferries would be reduced when passing the marine park, the abundance of dolphins is still dropping drastically in the midst of frequent high-speed crafts. EIA (Environmental Impact Assessment) Report of Third Runway states. After 7 years, can we still see dolphins in Hong Kong waters? The Third Runway reclamation of HK Airport is going to devastate 640ha of dolphins’ habitat permanently. EIA report published in 2014 proposed setting up a Marine Reserve (2400 ha) in northwest Lantau water, which will act as a compensation for damaging dolphins’ habitats and life. Despite its large area, the proposed Marine Reserve is geographically based on the original Sha Chau and Lung Kwu Chau Marine Park (SCLKCMP) as the core. Other area is roughly formed by picking remaining useable waters around the airport, obviously not targeting the important habitats of dolphins. Furthermore, reclamation construction has started since 2016 but the Marine Reserve will not be set up until 2023. Dolphins can hardly enjoy this belated conservation. It is believed that the third runway project, being the second largest reclamation construction in Hong Kong, is very likely to eradicate all dolphins in north Lantau waters, and seriously deteriorate ecology in west Lantau waters. High-speed ferry: reason for scattered habitats in south Lantau waters? Back to 2000, South Lantau waters included several core habitats of dolphins and porpoises. Chinese White Dolphins were active around Soko Islands in the Southwest Lantau waters and inshore Fan Lau, while finless porpoises mostly appeared around Soko Islands and also Pui O Bay and Shek Kwu Chau in Southeast Lantau during winter. Among them, Soko islands, as habitats for foraging and parenting, was particularly a key character for both CWDs and FPs. To arrive waters near Soko islands, CWDs had to go across waters between inshore of Fan Lau and Soko Islands, where the Lantau South Fairway locates. The piece of waters acted as an essential path for dolphins, and therefore was a core travelling corridor with rich ecological value. Unfortunately, when the Taipa Temporary Ferry Terminal in Macau opened since 2007, the number of high-speed ferries between HK and Macau kept soaring. Those ferries ran 185 times per day in 1999, which gave rise to 330 times per day in 2010 with almost 80% increase. Since then, overlapped by the southern fairway, dolphins’ core travelling corridor is frequently occupied by ferries with 40 knots. Result of dolphin research showed that dolphin densities (DPSE) in Soko waters dropped drastically by 75% because of frequent high-speed ferries. Obviously, ferries on the southern fairway are the main reason explaining the declining number of dolphins in Soko waters. After the core travelling corridor being occupied by high-speed ferries, dolphins in inshore Fan Lau have to bear threats and noise from high-speed ferries in order to travel near Soko Islands. Dolphins used to be living in the South Lantau inshore waters due to the limitation of water depth, were forced to give up Soko waters as their foraging habitat. This further reduces their activity range. The once-connected core habitats now become scattered apart all because of high-speed ferries. Slogan of new government – ‘Lantau Island: Development in the North, Conservation for the South’. On 3 June 2017, the government announced the Sustainable Lantau Blueprint that stresses on ‘Development in the North, Conservation for the South’ and ‘Balancing Development and Conservation’. The Blueprint outlines measures protecting Chinese White Dolphins, including building 4 marine parks. In these 4 marine parks, two of them are compensation measures for third runway construction and waste incinerator in Shek Kwu Chau. The other two proposed marine parks (Southwest Lantau Marine Park and Soko Islands Marine Park) are also not new ideas. We had already suggested building these two marine parks 10 years ago, while government had promised the proposal in 2002. Yet, up till today, the pieces of waters are still being unprotected. The government decided to introduce even more reclamation projects through announcing the blueprint, but all the measures protecting CWDs are neither original nor innovative. The proposed marine parks are only for alleviating damage brought by intense reclamation at the moment, but not targeting any new reclamation projects. Today’s Chinese White Dolphins in Hong Kong are facing six major problems, including habitats loss, water pollution, noise pollution and high-speed ferries. Dolphins’ pressure could be alleviated if any one of these problems being removed. One of the core targets of ‘Saving the Handover Mascot’ campaign is to remove threat brought by high-speed ferries. Dolphins habitats are shirking due to human activities. Not only does reclamation damage dolphins’ habitat permanently, rumble of construction also forces dolphins leaving original home, or worse, cutting habitat into two. If we can simply reduce noise production and allow dolphins to get back to their original foraging site, a more favourable habitat is provided. It is our other aim, through relocating high-speed ferry channel, to retrieve an important habitat of dolphins – Soko Islands waters so that high-speed ferries would not block dolphins from this piece of water. In order to protect dolphins’ habitats for parenting, foraging and migrating, we believe setting up marine park on these areas is a possible and advantageous solution. Under marine park regulation, speed of power-driven vessel and fishing are regulated which could definitely improve quality of dolphins’ habitat. Thus, our long-term aim in this campaign is to combine all the fragmented marine reserves into a large-scaled marine park. In short term: Moving the high-speed ferry route in South Lantau to further south. Removing any high-speed ferry disturbance from dolphin habitats and return those waters to dolphins. In long term: Enlarging and connecting marine parks from North Lantau to Southwest Lantau. Our advice: Changing the high-speed ferry route from the north of Soko Islands to the south. ✔ Removing threat – to ensure CWD habitats will not be disturbed and affected by rumble and impact by high-speed ferries. journey may be extended by 10 to 15 minutes, similar to the current adjustment of SkyPier ferry route. Affected by North Lantau construction, many dolphins have migrated to Southwest Lantau waters to seek better habitats. If the high-speed ferry route in South Lantau is relocated, the biggest threat to CWDs in Southwest Lantau waters would be removed, increasing ecological values of the waters and enlarging the whole living space for CWDs. This is also the fastest and the most effective measure to tackle the declining dolphin number in order to compensate the loss of habitat in North Lantau. Although voyage time and fuel cost are going to increase, it allows ferry companies to take sustainable corporate social responsibility for Hong Kong society. ✔ Enjoy spill-over effect – when the fish in marine park arrives certain number, more fish will appear outside of the protected area which therefore enrich fishermen’s catch. The current proposed marine parks in South Lantau are ‘cut’ apart by high-speed ferry route. Once the route is moved away and two marine parks are joined, a bigger and more favorable habitat for dolphins would be formed. Under the protection of marine park and marine reserve regulation, not only the ecological values but also dolphins’ lives can be safely guaranteed. Joining all marine parks into one and protecting it under legislative regulation can guarantee living quality of dolphins. Within this piece of water, dolphins will have sufficient food and space for breeding. Dangers produced by high-speed ferries and construction can also be eliminated. When the fish in marine park arrives certain number, more fish will appear outside of the protected area which therefore enrich fishermen’s catch. We propose, in long term, setting up a large and complete marine park in the west of HK waters, connecting SCLKC Marine Park, TaiO, YiO, Southwest Lantau and Soko Islands Marine Park. Only can this scale of marine park really increase the carrying capacity of dolphins’ habitat, and allow the number of dolphins back to normal standard. Dolphins therefore will not be extinct in Hong Kong waters. The Sustainable Lantau Blueprint was recently unveiled. The conservation measures to Chinese white dolphins are very disappointing. There are no dolphins coming back but leaving in Northeast Lantau despite the designation of the Brothers Marine Park. This is the result of the reclamation projects nearby. Therefore, the effectiveness of marine parks as a compensation to dolphins is highly doubted. The proposed Southwest Lantau Marine Park and the Soko Islands Marine Park does not include the critical travelling corridor which fragments the protected areas and greatly limit the value of conserving dolphins. There were no new conservation measures in the Sustainable Lantau Blueprint while the traffic of high-speed ferries is still a serious threat to dolphins due to the underwater noise and vessel collision. This threat should be removed as soon as possible to link up the fragmented proposed marine parks. As Chinese White Dolphins are losing a large area of marine habitat in the North Lantau waters, more high quality habitats in other areas in HK, including West and South Lantau waters, need to be secured for their conservation. Rerouting the high speed ferry traffic away from South Lantau waters will secure a safe and high quality habitat for CWD to offset the huge loss of dolphin habitat in North Lantau waters, and should be a high priority for action to reverse the alarming downward trend in dolphin numbers. Connecting the proposed SWLMP and SIMP without any fragmentation between them will create a larger and more coherent marine protected area with proper measures and enforcement. If done properly, the ecological value in South Lantau will be greatly enhanced for the dolphins, and they can utilize both marine parks more efficiently and safely. 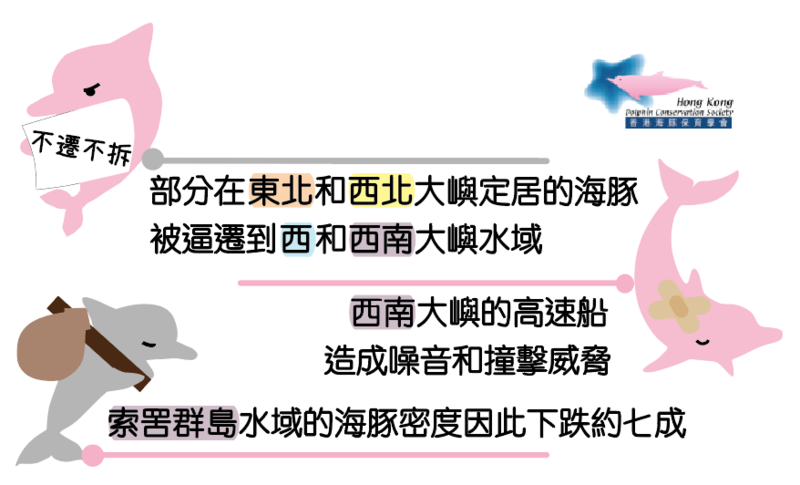 In the long term, a large marine protected area in the western waters of Hong Kong should be established to connect the existing Sha Chau and Lung Kwu Chau Marine Park, Tai O, Yi O, and the proposed SWLMP and SIMP. A marine protected area of this scale is the only way to ensure the long term survival of CWD in Hong Kong waters. Read the whole Petition letter here. Hong Kong Dolphin Conservation Society (HKDCS) would comply with the the Personal Data (Privacy) Ordinance issued by the HKSAR and your personal data will only be used for the petition. Your personal data will be properly handled and stored by us in accordance with the Personal Data (Privacy) Ordinance.